Many people hire our charter bus service for short bus rides, like from the airport to a hotel, or from a central pick-up location to the office. However, what if you’re taking a much longer shuttle bus trip, such as a tour of wine country? When you do this, you’ll quickly find that your back can be unhappy with all that sitting. In our last blog post, we covered a few tips for how to stay comfortable, and today we’ll look specifically at tips for your back. 1. Begin to prepare a week or two in advance. If you are familiar with back pain, you know better than anyone that a healthy back doesn’t come from a few hacks or quick tweaks. It comes from a lifestyle of being watchful about your back, doing your exercises, and engaging in long-term strategies to sustain your back. 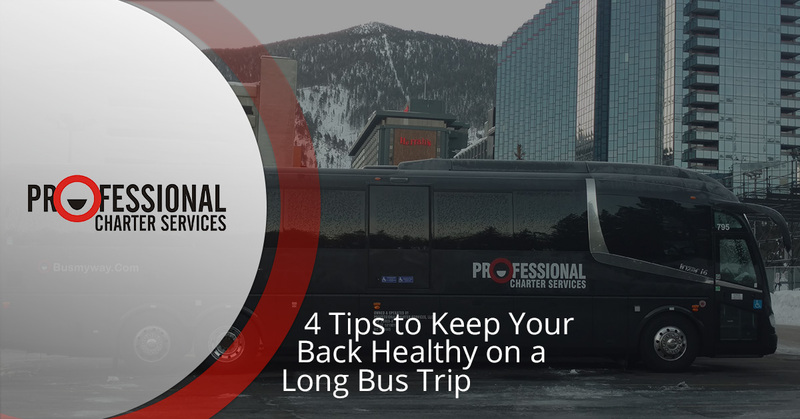 Ensure that you don’t hurt your back by being proactive in the weeks before your scheduled trip. Don’t miss your back exercises. Practice keeping excellent posture so that it’s second nature on your trip. If you were preparing to run a 5K race, you’d spend some time training. You should view your long bus trip the same way, especially if you’re prone to back issues. Treat it as an upcoming athletic accomplishment, and train for it until you’re sure that you’ll be able to make it the whole day. 2. Move around when possible. It’s a bit easier to get up and move around when you are in a charter bus than when you are in a plane, but it’s still not something that you can do constantly. Take the chances that you do have to get up, especially if the bus is stopping at a location where it’s optional to get up. Get up and walk around for the sake of moving your body, regardless of whether you want to. 3. Sit with excellent posture. Poor posture is one of the main culprits that causes back pain, especially lower back pain. When you are slouching, the curve of your lower back gets forced into the opposite position of what it’s supposed to have. If you can envision your back as the letter C from the top of your head to the tailbone, then your posture is putting strain on your lower back, resulting in the likelihood of developing pain. Instead, imagine that a string is emerging from the top of your head and pulling you up. Your back should be erect overall, with your head balanced straight above your shoulders, and a very subtle “S” curve in your back, with the lower back curving in the opposite direction of the upper back. When you sit with the proper posture, you should not feel any tension in your shoulders, neck, or back muscles overall. If you find your shoulders hunching up, make a conscious effort to breathe deeply and relax them. However, there is a set of muscles that you can (and should) engage for better protection of your back, and that is your core. Your core is a complex set of muscles that are located in your torso, and a strong core can have immeasurable benefits to supporting a healthy back. While you’re sitting in the seat of the bus, actively engage your core muscles, and they’ll go a long way towards reducing your back pain. Remember what we said about training in advance? It can be tiring to keep engaging your core if you’re not used to it. Practice makes perfect, and if you are always in the habit of keeping your core tight and hard, you’ll be able to do it on your charter bus trip much more easily. We look forward to serving you. Contact us for a quote to get started today.